Each year, the IAJGS presents achievement awards to recognize excellence within our avocation. The Awards Committee consisted of Hal Bookbinder (chair), Daniel Schlyter, and Martha Lev-Zion. 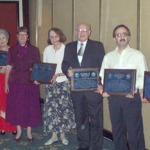 The recipients were announced at the closing banquet of the 21th International Conference on Jewish Genealogy held in London, England on 12 July 2001. Jerry Emdur once again generously provided the awards plaques. In deep appreciation of Peter’s contributions to the world of Jewish genealogy, both in his selfless assistance to others in pursuing their own research and in his efforts in gathering and indexing genealogical materials for the benefit of all. Among these are his outstanding work on identifying resources and creating finding aids at the United States Holocaust Memorial Museum, his extensive support for the Yizkor Book Project, and his ongoing contributions to Stammbaum. for their indexes of the 1784 Alsatian Jewish Census, and of 18th century Alsatian marriages. Dan and Rosanne have worked tirelessly in making Alsatian resources available to Jewish genealogical researchers. The 1784 Alsatian Census was organized by villages, making its use difficult. Their published index, originally in microfiche, continues to be available through book form. Their more recent publication of an index to 18th Century marriage contracts allows researchers to reach back beyond 1784.
for the Index of Jewish Records in the FHL. The index created by Nancy provides a crucial key to unlocking the vast Jewish genealogical resources contained within the Family History Library. In addition to all of the generally-known records, Nancy located and made more accessible many Jewish records not previously known, including obscure records not otherwise easily found. The resultant index has been made available both through both CD/ROM and on the Internet. for Jewish genealogical database development. Michael has rapidly developed the technology behind numerous databases benefiting Jewish genealogists across the world, including, among others, the Jewish Records Indexing – Poland Database and the JewishGen Family Finder, ShtetlSeeker, Family Tree of the Jewish People, and Discussion Group Archives. His efforts have made vast amounts of material readily available to the Jewish genealogical community. In recognition of TOLDOT for the scope and quality of its articles. Each issue is filled with original material, impressive both in its scholarly content and in its readability. The journal’s layout is clear, clean, and professional. Each issue adds to the knowledge base of the worldwide Jewish experience and is anxiously anticipated by its readers around the globe. Recognizing its efforts to spread awareness of Jewish genealogy through its extensive local publicizing of Jewish Genealogy Month, 25 March to 23 April 2001. This included arranging for the publication of articles in various newspapers across Palm Beach County, sponsoring a lecture series, distributing posters, and conducting exhibits at local public and academic libraries. Recognizing several of the Society’s projects aimed at making historical records in the New York area more available to researchers everywhere; including projects to index Brooklyn naturalization records, burial societies in the New York Metropolitan area, and New York landsmanshaftn and other Jewish organizations. 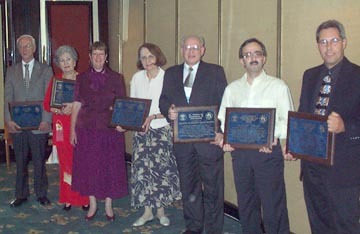 The results of these projects have been made generally available through the web site of the JGS, Inc.
From left to right: Peter Landé, Lifetime Achievement Award; Sylvia Furshman Nusinov, Outstanding Programming Award on behalf of Palm Beach County JGS; Ada Greenblatt and Estelle Guzik, Outstanding Project Award on behalf of the JGS, Inc. (NY); Paul Armony, Outstanding Publication Award on behalf of the Asociacion de Genealogia Judia de Argentina for its journal, Toldot; Michael Tobias, Outstanding Contribution via the Internet Award; Jeremy Frankel, Outstanding Contribution via Print Award on behalf of; Dan & Rosanne Leeson; Not shown is Howard Margol, Outstanding Contribution via Electronic Media Award on behalf of Nancy Goodstein.